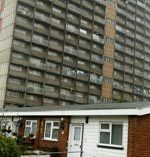 A new play written for and about the Beaumont Estate in Leyton, East London will be performed in one of the estate's blocks of flats just weeks before it is due to be torn down. As the 2012 Olympics creep closer, the skyline and architecture of East London is in the process of major change and Offstage Theatre Company as well as the residents and local communities want to document what the area means to them, as it is now and as it will be in the future. Regeneration doesn't always mean improvement and new play Home is a valuable document of a people and a place just moments before an irrevocable change. Offstage Theatre Company have been working with the residents and local community around the estate for the last three months, gathering their thoughts and feelings about the encroaching regeneration of the area. The material drawn from interviews was handed over to young playwright Gbolahan Obisesan who has shaped it into a play involving video projections, sound recordings and traditionally acted scenes that will be performed in a flat in the St Catherine's tower block - audience members will go from room to room, following the action and experiencing life in this Leyton estate as much as art imitating life will allow. Then, the tower block will be demolished. The play and the stories it tells will hopefully live on.